The Federal Government has successfully completed a 100-unit housing estate in Imo State under the Ministerial Pilot Housing Project of the Ministry of Power, Works and Housing. The project was built through the Federal Mortgage Bank of Nigeria to provide low cost housing for public workers across Nigeria. The Minister of State for Power, Works and Housing, Mustapha Shehuri, said the Federal Government through the ministry would continue to strive to ensure that the challenge of housing deficit in Nigeria was surmounted. He added that it was government’s plan to build mass housing units across the country for public workers over the next three years through a Public-Private Partnership arrangement. The minister was speaking in company of the Imo State Deputy Governor, Eze Madumere, who represented Governor Rochas Okorocha at the commissioning of the housing unit at Naze industrial layout in Owerri, the Imo State capital. He explained that national housing models have been designed and approved for each geo-political zone, to ensure the use of standard building materials. “This housing unit is a Private-Public Partnership (PPP) arrangement which will be affordable to Nigerians, especially public servants. “The Federal Government through the Ministry of Power, Works and Housing has signed a two billion Naira MoU with Shelter Afri (an African shelter company), to build affordable houses for Nigerians. “So I want to call on workers in Imo State to take advantage of this scheme,” Shehuri said. Commending the Federal Government for the project, Mr Madumere said the project would go a long way to complement the policies of the State Government in providing affordable housing units for workers in the state. He disclosed that the State Government was already in talks with the labour union in Imo State on the matter. 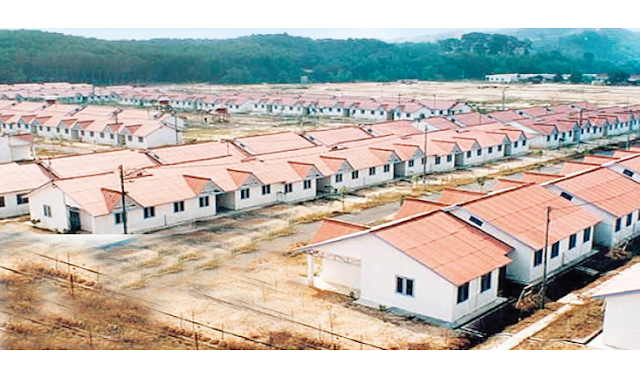 “This housing scheme is apt and what the state needs at this critical time; Imo residents need roofs over their heads. This is giving hope to the middle class earners. “For us, it is a commendable effort. My leader and Governor of Imo State, Owelle Rochas Okorocha, is ever ready to continue to partner with the Federal Government in such programmes and projects, since it is geared towards making life better for the people of Imo State,” the Deputy Governor said. In his address, the Managing Director of the mortgage bank, Mr Richard Esin, said the bank and the project have become effective vehicles through which the Federal Government actualises its policy for the provision of affordable housing for Nigerians. He added that with the consistent contributions of the National Housing Fund Scheme, Nigerian workers would become eligible for mortgage loans at concessionary interest rates of 6% per annum. “Through this scheme, over 2200 houses have been built for public workers by the Federal Government in all the six geo-political zones of the country. This in turn will surely address the housing deficit in the country,” Mr Esin said. Climax of the occasion was the launch and cutting of the tape of the housing estate as the dignitaries were taken on a tour round the facility. The 100-unit housing estate comprises of 48 units of 3-bedroom fully detached bungalows, 40 units of 2-bedroom semi-detached bungalows and 12 units of 1-bedroom terrace. As disclosed by the mortgage bank, the sum of 592.3 million Naira was invested for the development of the 100-unit housing estate. 16,999,900 houses still to be built to solve the housing deficit (according to the Housing minister).